Personally, I simply never outright rejected God, then God fully revealed himself to me and brought me to Church, then I was saved at the "Alpha Course". So, I would say God choose me, knowing that I would accept him fully. What about you? I'm more interested in personal testimony than theological debate, thanks! We must choose God, but He chose us FIRST. Both are true. 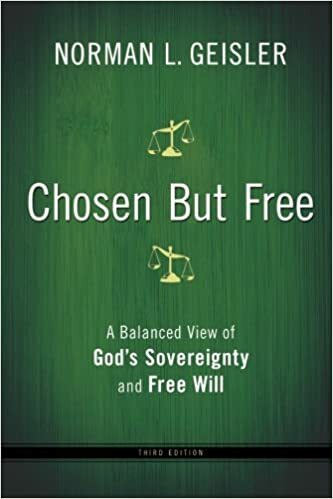 He chose in conjunction with His perfect foreknowledge of all future decisions - He has forever perfectly known all who would reject and all who would accept His salvation and invite Him in. But He also chose us based upon His criteria and Holy Character - so He chose those who He also knew would also eventually love and desire Him BACK - but no one can do THAT in only their own power. God's Holy Spirit draws us first - but we can either embrace Him or reject Him - God has given us free will. All we really can be is either willing to embrace God or unwilling. His grace is only effective on those so willing - those who will not permanently resist Jesus. He will guide all into salvation that are willing to be led there. Ephesians 1: "3 Blessed be the God and Father of our Lord Jesus Christ, who has blessed us in Christ with every spiritual blessing in the heavenly places, 4 even as he chose us in him before the foundation of the world, that we should be holy and blameless before him." John 15: "You did not choose me, but I chose you and appointed you..."
1 Timothy 2:3-4: "This is good, and it is pleasing in the sight of God our Savior, 4 who desires ALL people to be saved and to come to the knowledge of the truth." Titus 2:11: "For the grace of God has appeared, bringing salvation for all people." John 3:16: " For God so loved the world, that he gave his only Son, that whoever believes in him should not perish but have eternal life. For God did not send his Son into the world to condemn the world, but in order that the world might be saved through him." Matthew 28:19: "Go therefore and make disciples of all nations, baptizing them in the name of the Father and of the Son and of the Holy Spirit..."
Isaiah 45:22: "Turn to Me and be saved, all the ends of the earth; For I am God, and there is no other." Ezekiel 33:11: "Say to them, As I live, declares the Lord God, I have no pleasure in the death of the wicked, but that the wicked turn from his way and live; turn back, turn back from your evil ways, for why will you die, O house of Israel?" Ahh yes, irresistible grace perhaps? 'Bombarded' with God's love, how could anyone resist? Maybe if someone is hardened against God? Short careful response there. You'd think God pursuing us would be irresistable. This would be one area I'd disagree with many Calvinists on, afterall who could possibly resist God? So then, given only some are saved, God must necessarily "elect" some to be saved, and those God elects He pursues, and those God pursues couldn't possibly resist Him. One doctrine tends to lead into the next and I think such a system of theology certain deserves respect and reflection. Some perhaps dismiss it too readily, but it seems quite sound logic-wise. Accordingly, it would therefore be by God's gracious will that some are saved, while others by the opposite token are allowed to perish and fall on their own sword. Yet, if it is ALL dependant upon what God chooses and does, then there is no room for our decision to be in there. Where we have no decision, how can there be love? Our response is merely a mechanical response to God's pursuance. Irrisistable grace therefore necessarily leads to a contradiction as I see, if and only if one wishes to also claim that we make a real decision in response to Christ and/or truly love God back. I'd much rather place God's pursuing us under a "common grace" rather than an "irresistable grace". That is, God pursues ALL of us rather than an "elect" few. Only the manner in which God pursues is one that allows us to freely respond in love back, rather than out of fear or being completely saturated and overwhelmed to the point we no longer have any say (i.e., we're simply absorbed in a borg-like fashion). We choose God based upon a free response in love, not because we know He is almighty and fear for our lives before such awesome being. Inline with this, God pursues all of us delicately, without heavy handedness, without full force to the point our volition is overridden. His pursuing us is necessary to free us from our broken sinful state to a point where we can respond back, yet God still allows room for our true response to be had. A difference to Christianity as I see, is that people necessarily respond to Christ and God as such out of place of love, unlike conversions perhaps to Islam where force and manipulatiion is just as good. So then the hearts of some are indeed hard, as you say. Some would even become further hardened as God pursues them. Much like how clay hardens in response to the Sun, some in who they are just harden in response to God. With some persons, I see they're so clay-like in who they are, there's just no way God can navigate and reach such. This is how I see matters anyhow. How would you say he was bombarding you with love, or drawing you? We sing a lot of songs at church about God's love, and the ultimate proof of that being Christ dying for us, but I find it increasingly hard to 'feel' his love. As God's own word says, love is supposed to be expressed in action, not just felt (by the one who loves) and maybe expressed in words. Of course you could resist - but you didn't WANT to continue resisting. Your heart and mind, at a certain point, were intrigued, hopeful and willing to listen and be drawn. And with others, they are and remain UNWILLING. God's love and drawing are effective (irresistible) upon those with WILLING and open hearts and minds. The reason I posted the Scriptures is that many don't know them, or they may have read Calvinist distortions of Scripture that make them wonder about this issue - and worry. I was once tormented by this seeming dilemma until I got very serious about Scripturally studying it. At any rate, those posted Scriptures give a proper backdrop for the discussion at hand. And so I can say that I have seen what God has done for me (his action). And I see his love. Bible itself uses the terminology of drawing people. I mostly felt his love when became Christian. That week immediately after my conversion was wonderful. And also several days when my hubby died. Like being embraced (comforted) by love. Trying to find support for this in Bible. Need more time. Whatever we might FEEL about God in a given moment, may well be very inaccurate. We're instructed not to let emotions and feelings guide our sense of the truth of things. On the cross, why did Jesus exclaim (Matthew 27:46), "Eli, Eli, lama sabachthani? "(My God, my God, why have you forsaken me?)? Why did He, in His humanity, echo precisely what is written in Psalm 22? Had God's love deserted Jesus or the Psalmist? Of course not! But how did they FEEL in the moment? Did they sense the love of God in such human moments? Read Psalm 22 and Matthew 27. So we should be trusting in God's love for the future, as he has the best plan for us? That only seems to eventuate after death for some people, however. The psalmist talks about how bad things are already for him, and asks God to save him from the wild animals and so on. God doesn't save everyone who trusts in him from early or unpleasant death though. God never promised life wouldn't sometimes get very tough. And when God took on the form of humanity in Jesus, He Himself did not avoid great trials and things most people never go through. Nonetheless, God has promised us He will love and be with us during our trials. Often, it is through our trials that God teaches us important lessons - He allows us to go through things for His purposes for us. At other times, He prevents or provides escape from our difficulties. And for a Christian, death is most welcome, as even the most unimaginable last moment is immediately followed by great joy with their eternal presence of the Lord. But God does guide and watch us here and now. He does listen to our prayers, and He answers them - just not always in the manner we hope or expect. And sometimes, even His silence is an answer. And none of these truths are changed by however one might FEEL in a given moment. People go through trials and think God has abandoned them, doesn't love them or care - all which are completely wrong! Am still thinking about this, Nicki. Would you agree that someone can feel peace? If yes, if God gives peace and we can feel peace, could we also say the same about love?